Fully stocked 1 bdrm-1 bath unit with everything you need for a comfortable stay. 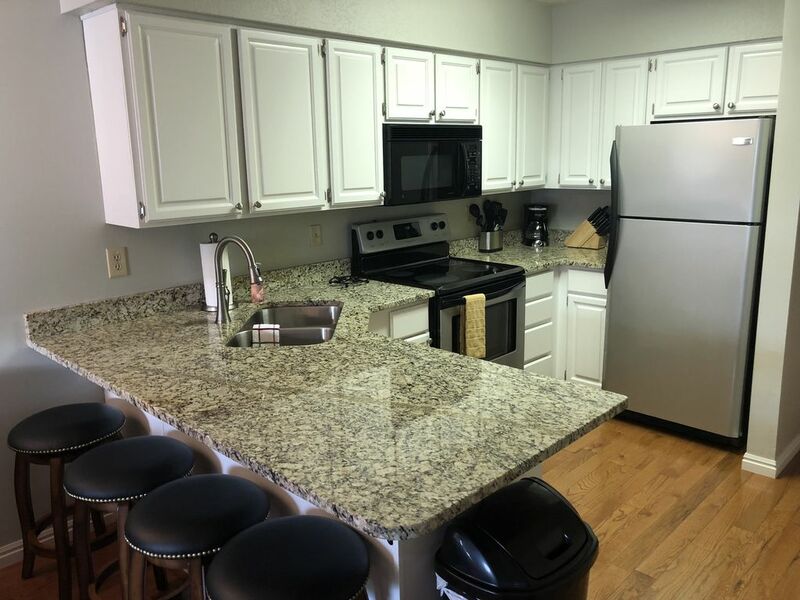 Our unit has recently been remodeled with hardwood floors, granite counter tops and stainless steel appliances. Top it off with new paint, new large towels, and new bedding. Our condo is the largest 1 bdrm floor plan at Wolf Lodge. Bedroom has a king bed, big closet, and a sliding glass door to a furnished patio. The front room has a 55" TV and a sleeper sofa that sleeps 2 comfortably. The complex has a pool (open Memorial Day to Labor Day), a year round hot tub, sauna, mini-golf course, tennis court, exercise room and a laundry room. Its 6 miles to Powder Mtn Ski Resort, 15 miles to Snow Basin, & 3 miles to PineView. It's close to hiking & golf. 20 min to Ogden & 50 to SLC. My wife and I are educators on the other side of the mountain. We were looking for a place that had all the outdoor activities that we loved. We didn't have to go far to find it in our backyard. This property allows us to stay close to the slopes in the winter and gives us plenty of options in the summer to fit our active lifestyle. This property is close to all the outdoor activities that Utah has to offer. It was close to skiing, golfing, hiking, and all the water sports we enjoy. It offers plenty of space for our family and a full kitchen to keep expenses down. The property is clean, upgraded, and comfortable. The kids can stay busy on the mini-golf course, the basketball courts, playing tennis, and hang out at the pool. The adults stay busy golfing, exercising, catching rays by the pool and relaxing in front of the tv. Base board heaters in each room. New high quality sheets, duvet cover, throw blankets (fleece). 4 coin operated washing machines in a laundry room located on the Wolf Lodge property. 4 coin operated dryers in a laundry room located on the Wolf Lodge property. Free unassigned parking. Park anywhere. There is always plenty of open spaces very close to the unit. Brand new oversized (30" x 58") soft towels, hand towels, and wash clothes. Weight machine, elliptical, exercise bike, and treadmill located in the club house. Leather recliner, nice sofa that pulls out to a comfortable bed, coffee table, 55" tv with Direct TV (175 channels) and end tables. Stainless steel built in dishwasher. Stainless steel full size refrigerator. Stainless steel full size oven. Full size microwave and mounted about the stove. Stainless steel and black new coffee maker. Matching set of 8 bowls, dinner plates, salad plates, glasses and coffee mugs. Plenty of spoons, forks, and knives. Remodeled with granite, stainless steel appliances and hard wood floors. Fully stocked with everything you need to cook, bake and eat. All you need is the food. Round counter height table with 2 chairs . There are also 4 bar stools that all fit at the granite bar. Cement deck off the back of the master. Includes two chairs and a small end table. Located in each bathroom of the club house. Outdoor pool open from Memorial Day weekend to Labor Day weekend (weather permitting). Great condo and location! Clean, stocked with everything we needed, and great communication from the owner. Will stay here again! Very clean and well stocked condo, nothing was needed that wasn’t there. Owner very friendly and communicative. No hesitation with the 5 star or personal recommendation. The unit was great for two people. Every thing was newly remodeled. We had a great time. The unit was just remodeled so it looked very nice and up to date. The bamboo mattress on the bed was very comfortable. When the microwave wouldn't function, the owners came right away to do a temporary repair and left an additional microwave in case the repair failed (it didn't). The unit also had a lot of the basics so we wouldn't have to buy them: flour, sugar, cooking oil, salt, pepper, dish soap, dishwasher soap, and several other things. The TV worked well and the Direct TV added several channels, although most movies were Pay per view. It provided a warm cozy home away from home. Great for 2 people. Everything was perfect. The only constructive comment is it would be very helpful if you provided a tide pod or two.